The swift departure of a professor and even swifter arrival of a strange letter from him sparks intrigue between between the boys and the staff at Eton. It doesn't take long for Pritpal, Perry and Bond to realise that the letter is actually a code that leads to the whereabouts of the professor. It's a race against time to find him and the machine he's been working on for the Russians. Above: UK first edition paperback cover. The third instalment in a planned series of five titles, written by Charlie Higson, sees the young James Bond pitted against the dangerous criminal underworld of interwar London, a world of illegal gambling dens, Cambridge spies and East End gangs. Here you’ll read about the experiences which turned the boy into the steely and ruthless secret agent that Bond becomes as an adult. Above: US first edition hardback cover. 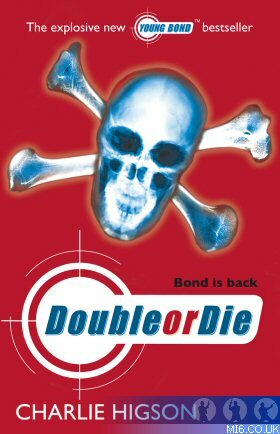 Thousands of Young James Bond fans voted for their favourite of three given titles, devised by the author Charlie Higson: Double or Die, N.E.M.E.S.I.S. or The Deadlock Cipher. This is the first instance that readers have decided the title of a book. The vote was conducted via the Young Bond website (www.youngbond.com) between 3rd October and 3rd November, where fans could read an exclusive extract from the book. The title of Young Bond 3 has been kept a closely guarded secret since voting was closed and the books have been printed under high security, each sealed in its own special foil packaging to conceal the title. Charlie Higson revealed the title in front of Young Bond fans at a special party at Waterstone's Piccadilly today, where he also discovered the title for the first time himself. The new book is an explosive, action packed thriller that sees the young James Bond delve in to the dark underworld of illegal gambling dens, Cambridge spies, East End gangs and tough Irish dockers. 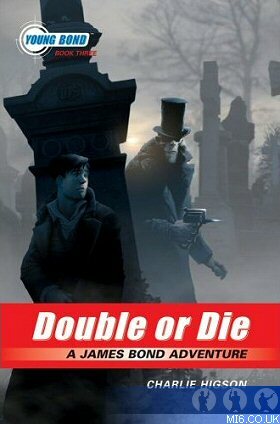 In Double or Die, James finds himself in close quarters to one of the most notorious gamblers and proves to be very lucky at the roulette table. Twelve year old Billy Jones from Manchester, whose name appears in the book, was also at the party. Billy earned the opportunity to be in the third Young Bond book when he triumphed at the Young Bond Stunt Academy in January 2006. He and ten other contestants were taught the skills of a young secret agent by stunt professionals at a special day held at Eton College, Windsor, where both Ian Fleming and Young Bond went to school. The latest Young Bond instalment features Billy as an able sidekick to Red Kelly, one of Bond's closest allies. "Put him out of the way," said Babuska. "Then throw him somewhere in the North Sea." Charnage looked at Babushka. He looked into her merciless black eyes. "...I care nothing for my country." "You betrayed everyone," said James. James looked across the table at Gordius, trying to keep a straight face. "Do you have the five pounds on you?" he said. "Or will you have to borrow it?"